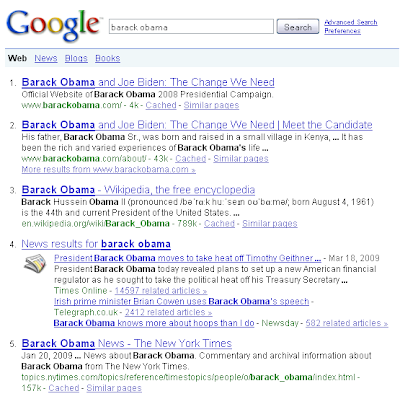 What are the top sites that rank for a “Barack Obama” query on Google? Not surprisingly, barackobama.com holds the top two spots, and lo and behold, Wikipedia ranks fourth. Apparently, there is some news on the subject as well and then at #5 – a page on nytimes.com. Clearly, the New York Times has to have hundreds if not thousands of articles on Barack Obama. How did Google settle on this particular article? The answer: the New York Times told Google which page to rank. The New York Times has created a Barack Obama resource with latest news, photos, videos, and a biography. The title of the page is Barack Obama News, h1 is Barack Obama, and even the bread crumbs include Barack Obama, but these attributes are not why this page ranks so highly for a “Barack Obama” query. This page ranks highly because the New York Times decided to point every Barack Obama link on their site to this page. Ranking for high-trafficked terms takes laser sharp focus, and the New York Times has adapted the internal linking structure popularized by Wikipedia not only for people but for companies as well. Who do you think ranks 6th for “American International Group” queries behind aig.com, Wikipedia, and Google News? That’s right – a page on nytimes.com dedicated to the company with information on the company, its stock, and peers. The Wikipedia internal linking structure is not new. IMDB and ESPN use it as good as anybody. Searching for a film or movie star, chances are IMDB is a top listing. 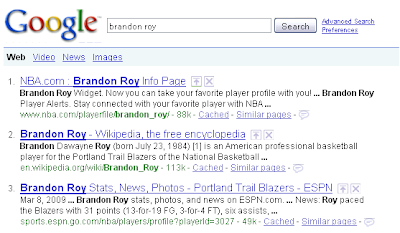 Looking for a basketball team or info on Brandon Roy, and you will find ESPN near the top. What amazes me is how few companies use it. Sure ESPN and the New York Times are publishing giants with hundreds of thousands of articles, IMDB is a database of thousands of movies and stars, and Wikipedia is an encyclopedia with hundreds of thousands of entries, but aren’t we all publishers by now? Does your company not have a blog? Are you not consistently producing whitepapers or press releases? Are we all not creating massive amounts of content? What is missing is generally not the content but the focus. Where do I point widget? What is great about the above companies (well, probably not Wikipedia) is that they had the same problem, but these companies chose to create a solution. The New York Times created a page for Obama and AIG. IMDB created pages for Slumdog Millionaire and Jennifer Connelly. ESPN created a page for the Memphis Tigers. If Anvil Media utilized our publishing properties to their full extent. What would we have to do? Create pages that encompass what we are defining as social media marketing and ppc management – case studies, best practices, our services, definition, etc. Optimize the page elements – Title tag, headers, etc. Not too tough, huh? Are we going to see the same effects as a publishing giant? Probably not. Are we going to see improved results? Assuredly. The New York Times appears ahead of the game. Looking at current articles on the site, they have shifted their focus to President Obama currently ranking 10th for “President Obama” queries) and AIG (currently 24th). That sneaky, innovative New York Times.